Question for everyone. Assuming heat isn't a factor, how far can you walk your chow chow on a daily basis? I'm considering a trip where I'd be hiking 10-20 miles a day for a week or so at an easy pace, and I'm wondering how far I could push my girl or whether I would have to go alone. Re: How much excercise is too much? Forever. We travel a lot with our fur kids, Florida, North/South Carolinas, Georgia, New York, Pennsylvania, Main and of course here in Canada through Manitoba, Ontario (where we live), Quebec, New Brunswick, PEI, Nova Scotia so far. They go all day, everyday, they love to play in the ocean, lakes, streams, and hunt everything (we have a large critter burial here). Hiking with us, rocky inclines, snow, ice, they have never had issues summer or winter. Our big fella ShenLung is now 10.5 yrs and still faster and with greater stamina than little 5 yr old sister FuShiLu. He can still run down a rabbit or fox (chases happen weekly) and has had his eye on a Red Tail Hawk for some time (3 attempts now). 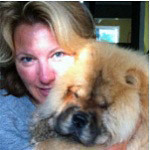 We also know several Chow owners that we cross paths with in our travels and they state the same, from Arizona, Florida and Alabama. Now ours have been on the go since puppies, and we keep them groomed and bathed regularly to ensure the wool and fur are in optimal condition with lots of water - ours love squeeze bottles of water and ask for them as needed. Two years back in North Carolina it was 48 C, they never stopped, but we were on the ocean. They have a lot of vacation buddies. Do not shave your Chow! I’ve seen this with the lamest excuses, keep in mind those coats are adaptive to the environment.